This post is sponsored by Graceland Fruit, but the thoughts and opinions are my own. 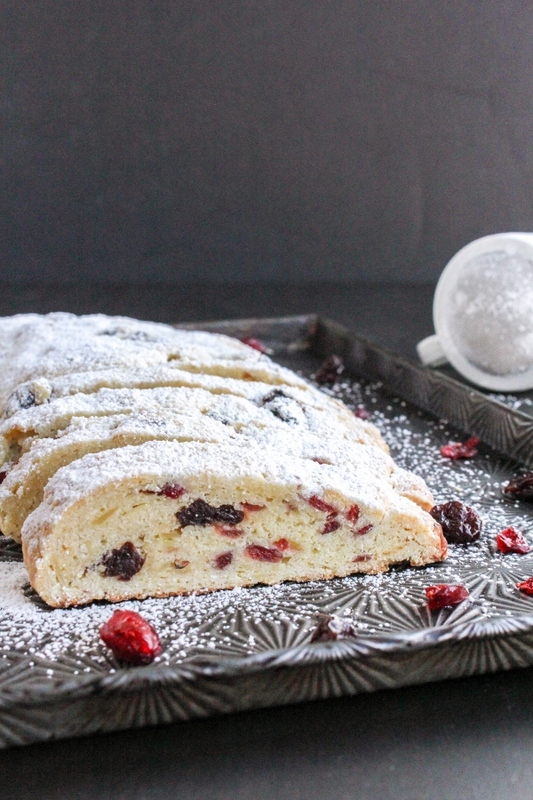 perfect to serve for breakfast on Christmas morning! Merry Christmas Eve Eve, my friends! I can't believe that Christmas is just two days away. It certainly has come fast this year and I still have a few things to finish up before I'm officially ready. What can I say, I'm a procrastinator! I've got my shopping done but I have plenty to wrap. I guess we all know what I'll be doing today. 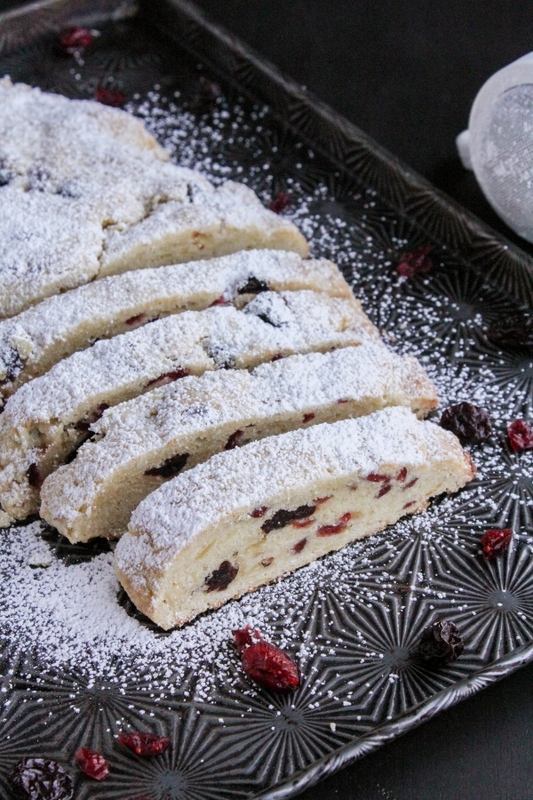 😉 Before the holiday gets here I just had to share one more of my favorite recipes with you...Christmas Stollen Bread! Stollen bread originated in Germany and is basically a sweet bread containing dried fruits and covered in powdered sugar. Sounds delicious, right? Well it is! I come from German heritage on my dad's side and have always loved eating traditional German foods. 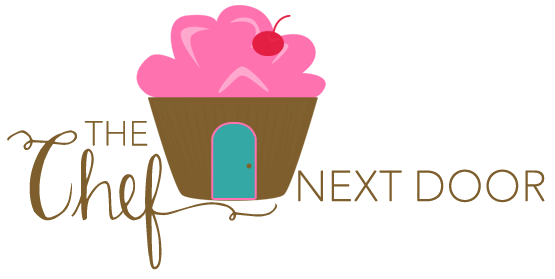 Of course all of the sweet treats are my favorites, especially Stollen Bread. Filled with dried fruits and sliced almonds it's slightly sweet, but not too sweet, and is perfect for breakfast or as an afternoon treat with a cup of tea. I've been eating this bread for years but just recently started making it at home. There are several versions out there and the traditional bread contains yeast, although mine does not. I opted to make a simpler version without yeast that is really easy and quick to make. 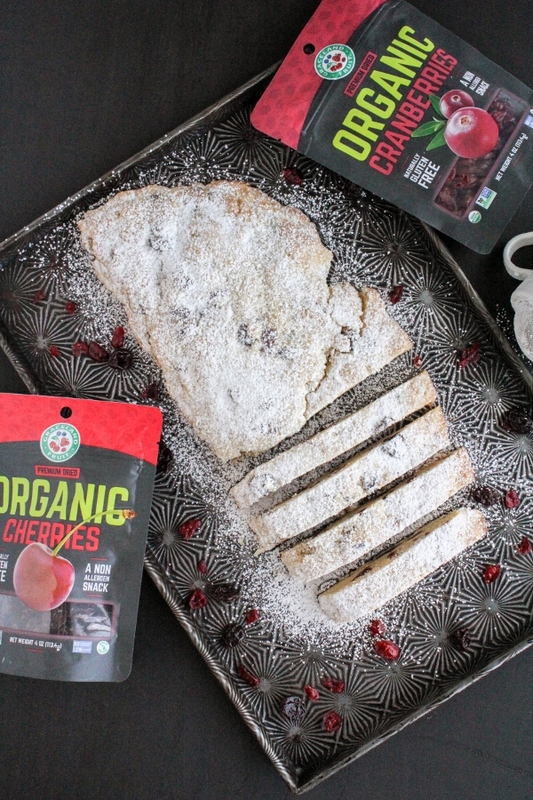 I've become obsessed lately with the premier dried fruits from Graceland Fruit and have been snacking on them like crazy, so I filled my Christmas Stollen Bread with their dried cherries and dried cranberries. Words can't really describe how delicious it is, you need to try it for yourself! Graceland Fruit is one of the largest single providers of infused dried fruits in the world. 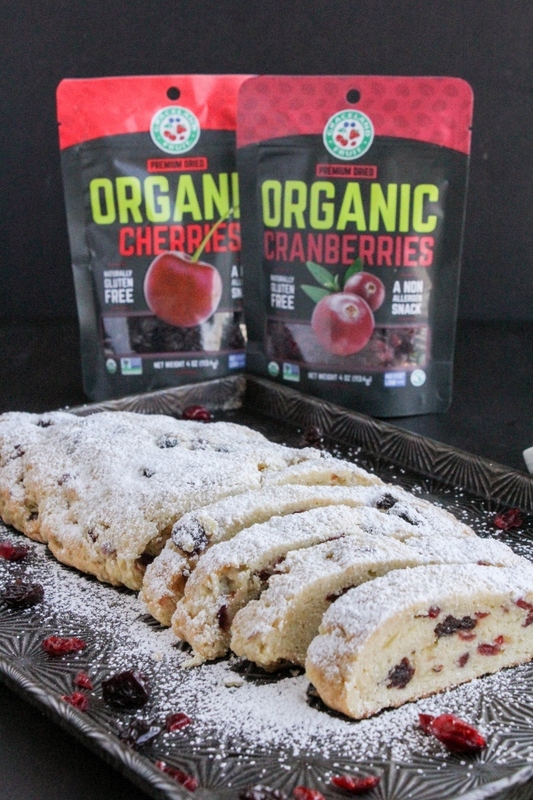 They primarily produce infused dried fruits such as cranberries, cherries, blueberries and apples, and their products are sold in the United States and over fifty other countries around the world. My favorite part? They are located right here in Michigan! 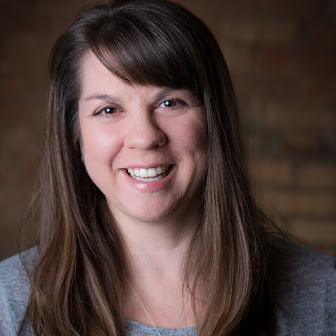 Frankfort, Michigan to be exact, in the heart of the tart cherry growing region. I love being able to support companies that are local to me. 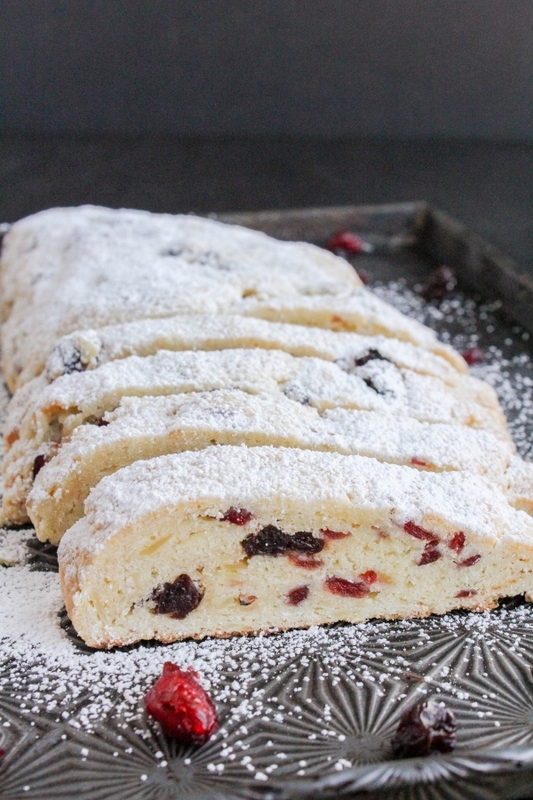 With Christmas just two days away, you still have plenty of time to make this Stollen Bread! Preheat the oven to 325 degrees. Line a baking sheet with parchment paper or a silicone mat and set aside. In a large bowl, whisk together the flour, sugar, baking powder, and salt. Cut the cold butter into small pieces then blend it into the flour mixture using a pastry blender or two forks to form crumbs. In a separate bowl, whisk together the ricotta, egg, and extracts. Place the dried fruit and almonds into the flour mixture and gently toss until evenly distributed. Pour the wet ingredients into the dry ingredients and mix until most of the flour is incorporated. Turn the dough out onto a lightly floured work surface and knead it a few times until it comes together. Roll the dough into an oval, about 10-in. x 8-in. in size. Fold one long side over to within an inch of the opposite side and press the edges lightly to seal. Place on the prepared baking sheet. Bake the bread for 40-45 minutes, or until golden brown. Remove the bread from the oven and set the baking sheet on a cooling rack. Melt the 3 tablespoons butter and brush over the entire loaf. Dust the loaf with a coating of powdered sugar. Allow the loaf to cool completely and then dust the loaf with another coating of powdered sugar. Slice and serve.